A rather stout, short-beaked (seldom more than 75 mm long) dolphin with sloping forehead and projecting lower jaw; dorsal fin high, falcate, and situated about midway from snout to flukes; pectoral fin broad at base, obtusely rounded at tip; upperparts plumbeous gray, more or less tinged with purplish, becoming black soon after death; sides pale gray, belly white; teeth 23/23, large, nearly round in cross section in adults, and conical; height above jawbone, 12-17 mm, diameter, 5-9 mm. Total length of adults may reach 3.5 m. A sub-adult male measured: total length, 2.9 m; length of mouth, 319 mm; tip of snout to dorsal fin, 1,275 mm; length of pectoral fin, 395 mm; vertical height of dorsal fin, 229 mm; breadth of flukes, 612 mm. 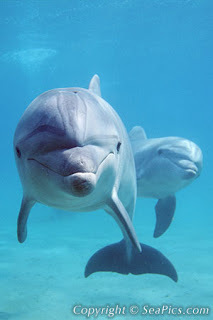 Bottlenose dolphins are distributed worldwide in tropical and temperate waters. 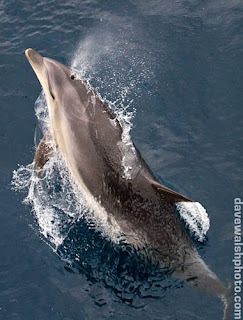 In the western North Atlantic, these dolphins occur as far north as Nova Scotia but are most common in coastal waters from New England to Florida, the Gulf of Mexico, the Caribbean, and south to Venezuela. This is the most common cetacean of the Gulf of Mexico and along the Texas coast. Bottlenose dolphins may be seen in groups numbering up to several hundred but smaller social units of two to 15 are more common. Group size is affected by habitat structure and tends to increase with water depth. Group members interact closely and are highly cooperative in feeding, protective, and nursery activities. These dolphins make numerous sounds and are probably both good echolocators and highly communicative. 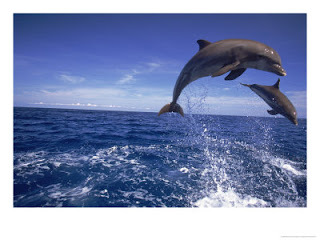 Bottlenose dolphins eat a wide variety of food items depending on what is available and abundant at a given time. In Texas waters they eat fishes including tarpon, sailfish, sharks, speckled trout, pike, rays, mullet, and catfish. They are also known to eat anchovies, menhaden, minnows, shrimp, and eel. They eat about 18-36 kg of fish each day. Commonly observed feeding behaviors include foraging around shrimp boats, either working or not, to feed on fish attracted to the boats. The dolphins also eat "bycatch" dumped from working trawlers. Groups of these dolphins have been observed cooperating in prey capture, with several dolphins herding fish into tight schools that are more easily exploited. Bottlenoses are also known to chase prey into very shallow water and may lunge onto mud banks and shoals in pursuit of panicked fish. Of 15 females captured in Texas waters, six that were pregnant were taken between December 17 and March 19. On the first date the fetus was 78 cm long and weighed 5 kg; on the last date fetuses were almost as large as some of the small calves. Nursing females were all taken between April 20 and September 11. These data suggest that breeding occurs in the summer and that the young are born the following March to May. At birth the calf is more than a third as long as its mother. The longest fetus recorded was 1.1 m in a female 2.8 m long; the smallest calf also was 1.1 m in length. Females give birth to a single calf and only give birth every 2-3 years. Males mature at 10-13 years of age and females at 5-12 years, when about 2.4 m in length. That the family group may remain intact for nearly a year is suggested by the capture on February 24 of a pregnant female and a young male approximately 1.5 m in length. These two animals were traveling together and were presumably mother and son. 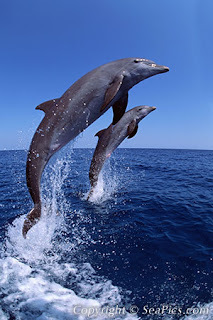 Bottlenose dolphins are the most widespread and common cetacean of the coastal Gulf of Mexico and are commonly seen in bays, estuaries, and ship channels. Two distinct forms may occur in the Gulf. These are inshore animals that inhabit shallow lagoons, bays, and inlets and oceanic, or offshore, populations that remain in deeper, offshore waters. Interaction between the two populations is thought to be minimal. Populations of these dolphins in the southern and central portions of the Texas coast appear to increase dramatically in fall and winter. Either offshore dolphins move into nearshore waters during these seasons, or dolphins from adjacent bay systems move into these coastal sections. There is some evidence of a winter decline in dolphin numbers off Galveston. 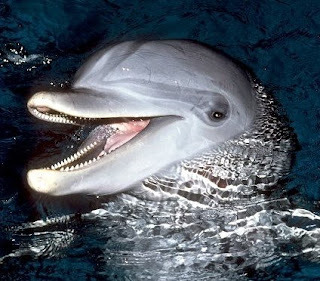 The bottlenose dolphin is the only cetacean for which census techniques have yielded useful population estimates in the Gulf of Mexico. Nevertheless, these estimates do not include offshore dolphins, which are difficult to census, and therefore underestimate the total Gulf population. A cumulative summation of aerial surveys estimates 35,000-45,000 bottlenose dolphins in the Gulf of Mexico. All cetaceans, including bottlenose dolphins, are protected from hunting by strict laws, but are affected by other human-caused activities. In the Gulf these include petroleum resource development, heavy boating traffic, and the pollution of Gulf waters, but the cumulative effects of these factors on dolphins are difficult to determine. Bottlenoses have been observed swimming through heavy oil spills and superficially show no ill effects. Bottlenoses may be able to adapt to man’s activities but probably are readily affected by pollution and would make a good "indicator species" signalling the overuse and excessive pollution of Gulf waters.